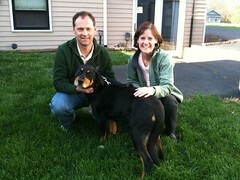 Izzy has been adopted! Her new family picked her up and she even had a furry Beagle brother waiting for her when she got home (who was also a former foster dog of mine). Her family reports... "She and Harley hit it off better than we expected. He actually got all excited and wanted to play with her in the yard... She is currently sucking on his Kong. But that is only fair -- he jumped right on the new mat we got for her and tried to chew her big Nylabone. Nothing is sacred here! She is doing better than he did on his first day with us. Within about 10 minutes of being in the house -- he peed on my nice oriental rug. She hasn't had an accident yet. We are all going to head to bed early as it has been quite an exciting day." Congratulations, Izzy! I will certainly miss her, but she is a very lucky girl and found an amazing family to call her own. 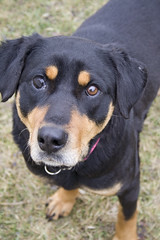 Izzy is a 3 year old, blind in one eye, adorably sweet Rottweiler/Labrador Retriever mix. She was rescued on a Humane Investigation where she had been living her life chained outside with inadequate shelter, food and water. I took her in as a foster and every day since she has pleasantly surprised me. I have fostered many dogs who had only known life on a chain and there is generally an initial period of helping them get accustomed to living inside a house. For some this is lengthier than others, but they all have been wholeheartedly grateful for the safety and extra attention they receive living inside with people. On many occasions I have had the opportunity to assist a friend of mine, a fellow Humane Investigator, in checking on the animals in a very hairy part of town on the south side of the city. The streets are lined with dilapidated homes - many burned out or collapsed and prime targets for drug dealers and other such illegal characters. It's the kind of town you usually go out of your way to drive "around" rather than "through" if it happens to fall along your route of travel. 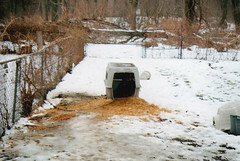 In this town I have seen some of the worst of the worst of animal abuse and neglect cases. Dog fighting is a popular "sport" in the area and the status quo is to keep your dog tied on a heavy chain, provide little to no shelter and give food and water only when it's convenient to do so. Chase has officially found a home. He fell in love with his new mom right away (and vice versa) and he now lives happy as can be with his two human teenage sisters and two other dogs. His mom, who works as a part-time groomer, reports that she was able to finish his haircut and he did very well for it. It had to be cut a lot shorter than she plans to keep him because of all the matting he had, but it's finally even. He is a very happy little pup now, and is feeling great to finally be in a real home with a family that loves him. Congratulations, Chase! After a very nervous first few days, little Chase was finally comfortable enough with me to let me give him a haircut and a bath. He is now clean and fresh and is noticeably feeling much better. I'm not grooming professional, but at least it's better than it was before when he was all covered in matting and filth. As you can see from the photo, he has begun showing off his interest in toys. 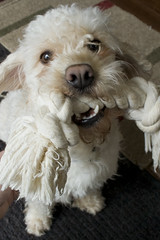 He is testing out some of the eco-friendly rope bones that we are considering selling at Pink Puppy Designs. He seems to be enjoying every minute of it. Chase like to play fetch, but after a few throws from me he usually ends up playing fetch with himself. He tosses the toy up over his head all by himself and then runs after it. He thinks that's just the best! 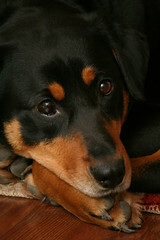 View Chase's online bio on the rescue's website. Chase is Miniature Poodle who is barely 2 years old. I originally found him while on patrol with my fellow Humane Investigator. He was filthy, covered in huge mats all over his body and was running loose in a rough neighborhood. We chased him for blocks until he made his way back home. After speaking with his owners (who, I might add, weren't too concerned that he was running in traffic) we discovered that their 9 year old son was Chase's sole caretaker and he was quickly loosing interest in the dog. They decided he was just too much trouble and chose to give him up for adoption. 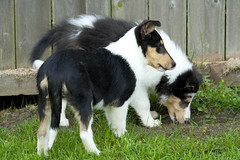 Stephanie of Pink Puppy Designs is also a Humane Investigator in Illinois. While on a case, she and her partner came upon a dog chained to a dilapidated doghouse. Rockefeller had been living there for 7 long years in a space of about 15 square feet day and night in all kinds of weather. After speaking with the owners about the inadequate conditions, they signed him over to be put up for adoption. Stephanie brought him home so he would have a comfortable place to stay while he waited for a new home. At first he was very nervous about everything relating to living indoors since it was all very new to him. However, he is now learning what it is like to be an indoor dog... loved, kept warm, given lots of attention... and he loves it. 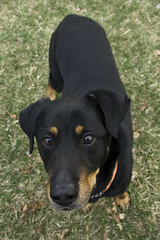 Rockefeller is currently available for adoption through Animal Education and Rescue (AEAR). For more information read his bio on AEAR's site. Pink Puppy Designs donated a Martingale Dog Collar to Rockefeller through our rescue partner program!